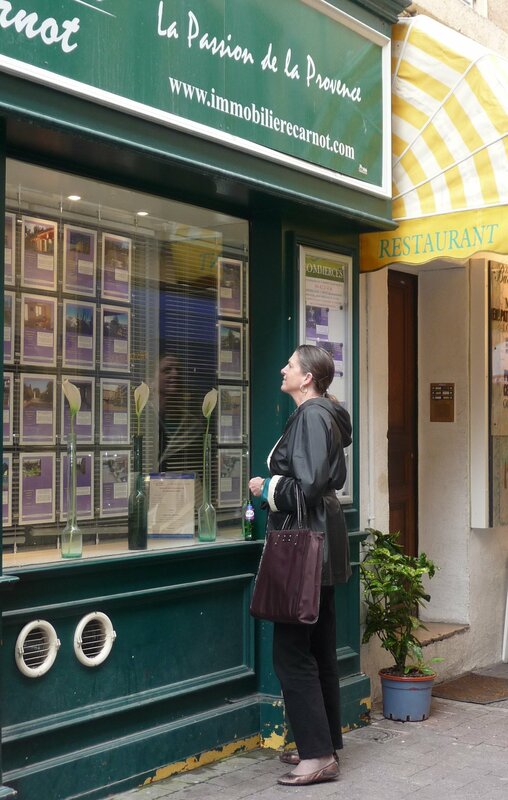 Just a Glance – Imagine a Place of Your Own in France! It all begins with an innocent glance. Those villas and elegant apartments in the Immobilier (Rea l Estate office) window look so enticing. From a glance, a pause evolves. Taking our morning coffee on that sunny terrace becomes imaginable. Entertaining friends beside that ancient 18th century fireplace mantle just seems right. Then we pick up the brochure advertising properties for sale; thumbing through it refines our preferences, separating what we don’t like from what we do. Then we start to dream….of a place of our own right here in this magical city. Aix en Provence, just 20 minutes north of Marseilles, has long been a favorite of ours, and continues to be so, any time of the year. Our very first Music and Markets tour, Music and Markets in Provence, was inspired by the music festivals nearby and the delightful open-air markets of Aix and other Provençal towns, and Aix is our base each summer for the week of music, cuisine, culture and discovery. Aixoise products find their way to our refrigerator and pantry in our home in Virginia and last May we introduced her charms to our daughter, her husband, and our grandchildren. Often, we enjoyed a symphony orchestra, a string quartet, or a piano solo in one of Aix’s several world class performance venues or churches. 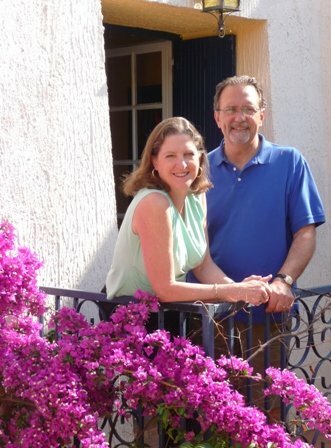 A few Aixoise – both American expats and people who’ve lived here all their lives – have become fast friends. 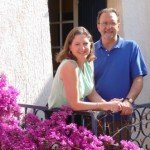 For several years we’ve been gathering those Real Estate brochures each time we visit, and becoming more and more attached to the notion that Aix is the place we want to retire some day, dividing our time here with months closer to our children and grandchildren. We’d circle apartments that looked like a good fit for us, dream some more, then toss the brochures in the trash when we got back to the States. For the past two Januarys we’ve rented an apartment in Aix for the month, using the time to improve our French at International School, and getting a feel for living here, rather than just breezing through like tourists. 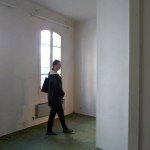 Those months have just cemented our desire to be here even longer, and those glances in the immobilier windows that became pauses have developed this year into appointments with agents and visits to empty apartments in town. But should we rent long term? Should we buy? A meeting with a friendly banker who was familiar with the real estate market was the final incentive to get us searching in earnest at the end of January. He explained how prices in Aix, typically on the rise, have been flat for some time, and that mortgage rates right now are at an all time low. There is no multiple listing service in France, so, armed with our banker’s pre-approval, we began by searching out every immobilier we could find in the town, peering with real purpose now in the windows at the photos, learning the abbreviations and acronyms, and jotting down phone numbers of agencies with interesting properties. But what are we looking for? What do we really want? The apartment we’ve rented this January has a terrace – we’d like that, wonderful views over the roofs to both the Town Hall and cathedral bell towers – we’d like a view, and the delight of hearing the hourly bells chime would be another plus. And this apartment is 58 square meters, around 600 square feet – this is an adequate amount of space to live in for months at a time. But one thing this place lacks that we’d also like is, as the advertisements say, charme de l’ancien – the charm of the ancient – which to us means tomettes (hexagonal terracotta tiles) on the floor, long windows, and high ceilings. We also determined to limit our search to the historic center of town – a pretty small circle compared to the hundreds of available newer apartments around the perim eter. 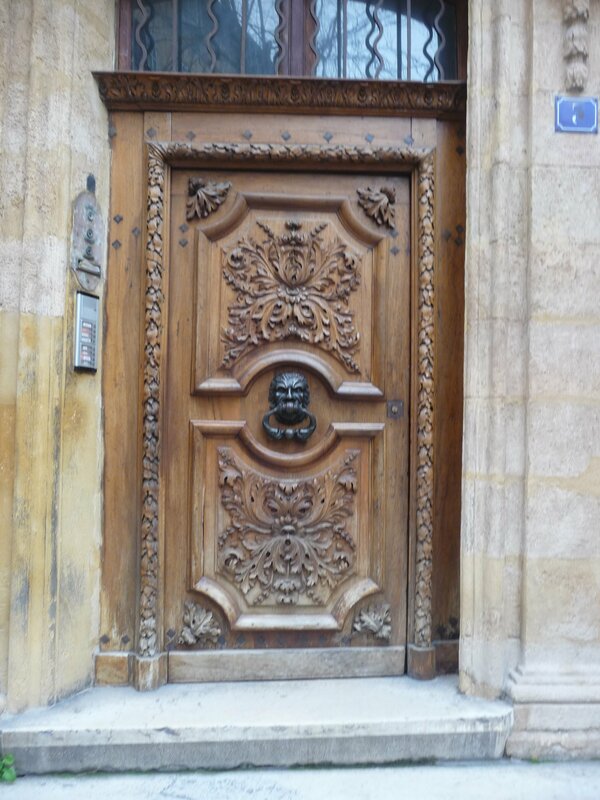 One more thing, many of Aix’s beautiful honey colored stone buildings have handsomely carved wooden doors with ornate carved stone surrounds. We add this typical kind of curb appeal along with an inviting entryway to our agreed upon unwritten list of “nice to haves”. Kirk has to fly back to the states, but I stay on a couple of days longer, talking with multiple real estate agents, and visiting about ten apartments. The first one is so uninteresting that I don’t even take notes. The second one is spacious and bright (a traverse m eaning it has windows on not just one side but two), but needs a lot of work – I’m overwhelmed as the agent starts telling me he’d first knock this wall down to open up the kitchen, then renovate the bathroom bringing it into the 21st century from the 19th. 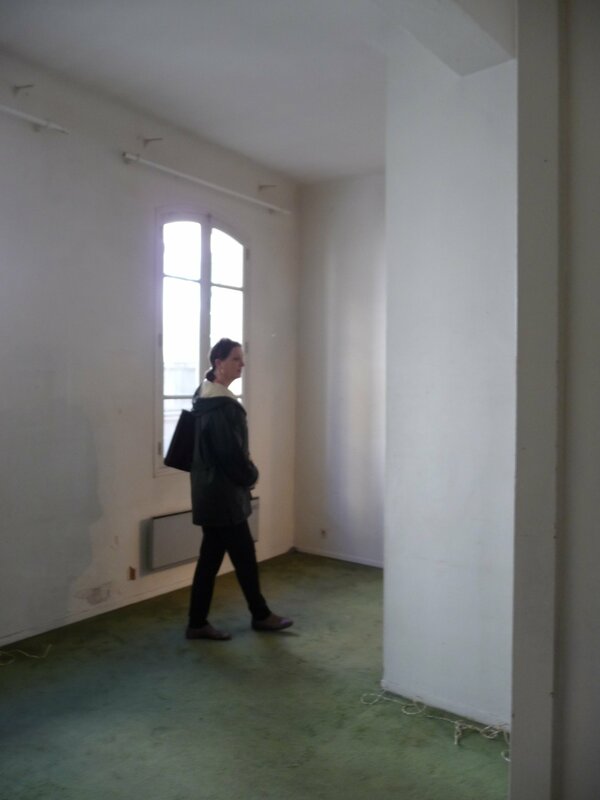 “With about 40,000 euros of renovation you could really make this great,” he continued. I’m not too good at imagining the finished product in an in-need-of-work place. And the idea of handling contractors and laborers from thousands of miles away, for months of work, on top of everything else we do each day, is hard to imagine. So this one, we can’t even consider. 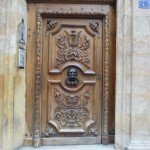 For two days I visit one place after another, and start to realize that an apartment with the size that’s right for us, in the historic center, with some of that old-fashioned charm seldom comes along. I fly home with pages and pages of notes, dozens of photos, and thousands of euros worth of renovation suggestions to share with Kirk. How soon can we get back – BOTH of us this time? This is not a choice I want to try to make alone. We start making plans for a February visit, a week FULL of apartment visits….